Beautiful remodeled Canyon Lake waterfront home on 1+ acre with a spectacular lake view. The house is a 3 bedroom, 2 bath. Master bedroom has a King bed and an attached large bathroom with dual sinks and tiled shower. The 2nd bedroom has a queen bed. The 3rd bedroom has 2 sets of bunk beds. The home features stained concrete floors, fully remodeled kitchen with stainless appliances, large open living & dining with new furnishings and great views of the lake. The covered back patio has a gas grill and plenty of seating looking out at the lake. Bring your boat up to lakeshore in the cove behind the home. Plenty of parking available. Located just off FM 306 and past the Silverleaf Hill Country Resort. Winter Texans welcome. Nearby Canyon Lake Marina, waterfront restaurant and a few miles from River activities on the Guadalupe. Whitewater Amphitheater featuring outdoor concerts just a few miles. Have a bigger group? Check out VRBO #414526. Andrew and Courtney are native Houstonians and high school sweethearts who live in the Sugar Land area with their three children. Andrew & Courtney are natives of the Houston area and both loved to visit Canyon Lake during trips to the Hill Country. They wanted to share their childhood memories of water skiing, boating and swimming in the lake, hiking and visiting surrounding attractions with their children and with others. This property has fantastic views of the lake and sunsets and is close to the attractions. You must experience the sunset sitting on the back porch of this property while watching the deer travel back and forth to the lake. Two - Master bath has a tiled stand up shower. Hall bath has tub/shower combo. Enjoy the scenic views from the living areas in the home as well as the master bedroom. Back porch is the perfect place to watch the deer at sunrise and sunset and have the perfect view for sunsets. This home is situated on Canyon Lake with approximately 300 feet of lake front. A short hike takes you to the lake for swimming with a gradual drop off. Relax and unwind with beautiful views of Canyon Lake. Swimming, boating, jet skiing, tubing are all a short distance from the house. Full kitchen, fridge with ice maker, dishes, paper towels, oven, range top. We spent a beautiful weekend!! House is clean and has all as described. Great place to relax with family and friends. We expect to come back shorty. Nice, large house with a fantastic view and easy walking distance to the water. Absolutely loved our stay there. Hope to return soon. Great, roomy house on the lake! Great, clean house on the lake waterfront. Rooms were roomy with comfortable beds (which many places lack). Open area floor-plan with plenty of windows with a view to the lake. A/C worked flawlessly on the 90 plus degree days, kitchen is stocked with everything to get you by. Nice size back patio with enough privacy and the gas grill ,(do wish it had a ceiling fan or two). Plenty of parking for truck and boat trailer. A couple of things to note is the shoreline is muddy/rocky, not a place I would say would be enjoyable for lounging/swimming at. Not an issue for me as we had a boat so we went elsewhere but be sure to wear shoes in the water at this location, there are sharp rocks, shrub stubs, holes, fishing lures, etc. This area also seem to be a catch all for people being it's about the only place with a cleared path down and an old road bed that leads from the west to the lake directly in front(behind) the house. With that of-course do not leave valuables on your boat when anchoring after dark. Overall great house that I would return back to. Loved our stay. The property is well maintained but inside could use some updating. With that said, you are paying for a priceless view and lake access. It was a quiet time and we enjoyed the encounters with wildlife. We hit many "hole in the wall" food joints and enjoyed that experience as well. It was everything as we remembered. This was our second time staying at Sunset Shore! We absolutely love it here and always hate to leave. The property is neat, clean and the sunsets are just stunning! We loved sitting under the patio, relaxing and feeding deer. We can't wait to plan our next trip to Sunset Shore! Canyon Lake is THE perfect vacation spot- so many activities on the lake itself, close to Wimberley, San Marcos, San Antonio, Austin and the beautiful hill country. 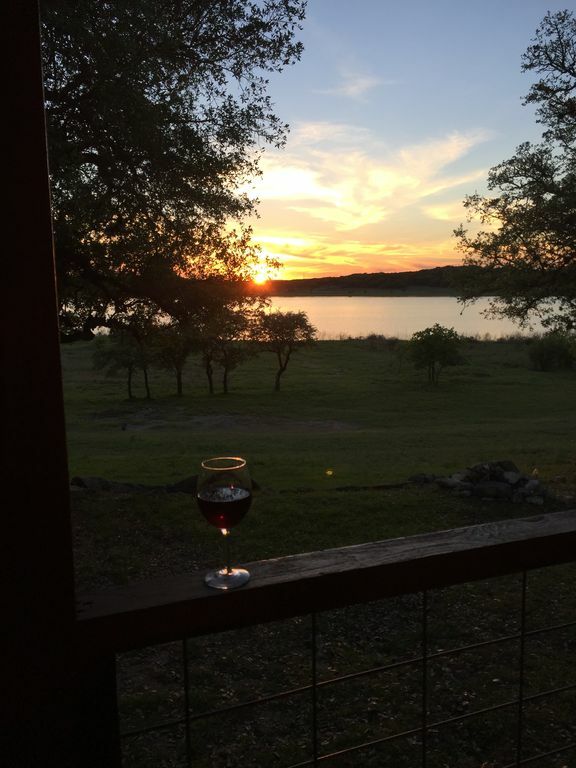 We love winery tours, hiking in the Canyon Lake area and swimming in the lake by the dam. This property is super convenient to New Braunfels, Gruene and the WhiteWater Ampitheater. Swim right at the property, anchor your boat by the property or use it as a launching pad to explore all that the hill country has to offer!